Place meat, pork rinds, and pork shanks in a large kettle and add about 5 quarts of water or enough to cover meat. Add approximately tablespoon salt and bring to a boil. Cook over medium heat for about 1 1/2 hours. Remove excess grease and set aside. Reserve liquid. 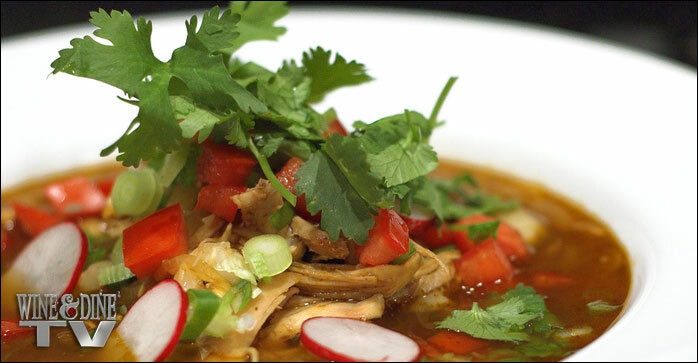 Wash the posole very carefully until the water is clear so as to remove lime from kernels. Put in large kettle and cover with water. Boil until posole has popped. Mix meat, posole, rind, and shanks or pigs feet. Add oregano, garlic, onion, and chile pods. Let simmer for about 1/2 hour.